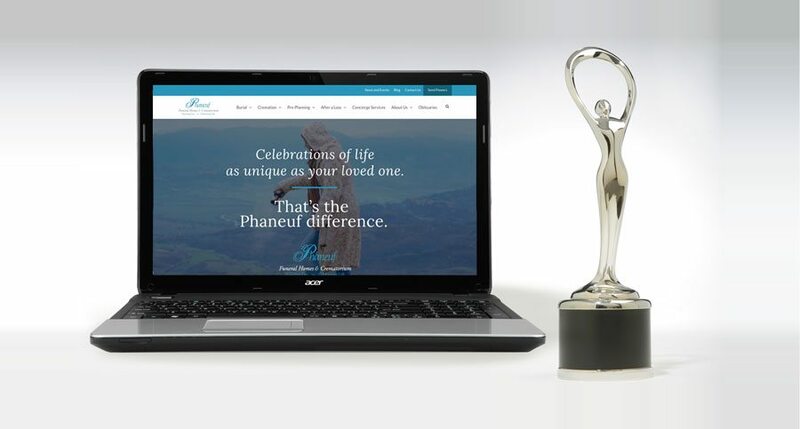 The new Phaneuf Funeral Homes & Crematorium website, which required a significant amount of strategic planning and design, was recently awarded a 2017 Communicator Award for Website Design. The website was launched in late 2016, by our marketing agency, Savoir Faire Marketing/Communications. The updated design is both modern and intuitive, with an easy-to use navigation, and plenty of ways for users to find information regarding available services, as well as general educational resources. Phaneuf’s new website is mobile-friendly as well, so that it meets the needs of viewers regardless of what type of device they are using. The font size and style, in addition to color contrasts were chosen specifically to improve overall readability for viewers of all ages. Because Phaneuf serves multiple types of customers, we wanted to make sure that no matter what information someone might be looking for, they could find it easily and quickly. The new site makes it easy for people to find obituaries, service details, information about funeral planning (and pre-planning), product pricing, and much more. Obituaries and a funeral-service calendar are located on the home page, with details available on interior pages. There are separate sections for burial and cremation services, with each section including educational resources as well as information on the company’s services. A resource section called “After a Loss” was built to serve people who have experienced a loss directly, as well as friends, family and other mourners. 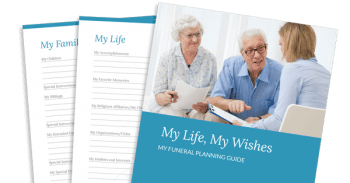 The new pre-planning section allows those people considering planning their final wishes to learn the hows and whys, and to download resources or make an appointment with a pre-planning counselor. And, for those interested in learning more about Phaneuf Funeral Homes & Crematorium, there is a robust About section on the new website that includes the history, awards and accolades the organization has earned through the years. The new website features an obituary database that is sortable by date or name, filterable by location and date of death, and searchable by keyword. The new system displays the most recent obituaries on the home page and location-specific obituaries on each funeral home location page. Upcoming funeral services are displayed in an event list as well as a calendar view, which allows visitors to easily see what services are coming up. The chat function was brought over from the previous site, and has been improved and designed to match the new website look and feel. We feel that the new design better serves our customers and members of the community. There is a great deal of helpful information throughout our site, which the new design has made more accessible to visitors. We’re very pleased with the work provided by Savoir Faire Marketing/Communications, and we congratulate them on a job well done.